Getting in the spirit of the season, Andrea Kelly’s Professional Practice students had the opportunity to earn extra credit by engaging in volunteer activities with the Lincoln community over the Thanksgiving holiday. By donating at least three hours of their time to a charitable cause students had the opportunity to earn three extra credit points, but many were rewarded with much more than a higher grade. 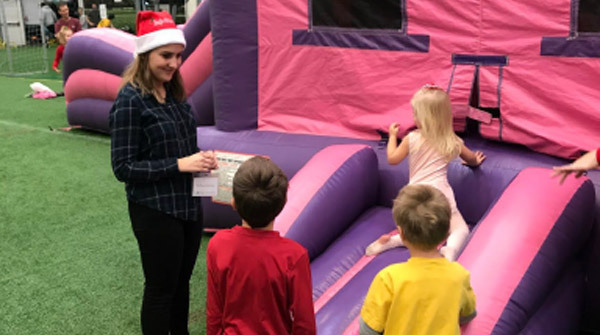 One of her volunteer activities included preparing the gingerbread station before the guests arrived to the festival and chaperoning children in the bouncy house area. For most of the students who participated, there were some strong commonalities, across the board. After this experience all the students said they planned to incorporate more volunteerism in their lives and had an overall feeling of gratitude. “I definitely walked out today feeling thankful for my family and the life I have,” said Paige Nelson after working with the Salvation Army’s Thanksgiving Basket Preparation project. “I also felt so much empathy for the families needing help with food, and toys for the holidays. I had no idea what that could be like, so I’m very glad I was able to help make their lives a little bit worry free during such a special time of year."